With seasonal spectaculars planned in Louisville, Lexington, Ashland and elsewhere around the Bluegrass State, you'll quickly find there's no better place than Kentucky for holiday horsing around. Happy holidays from Newport Aquarium! 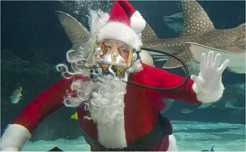 • Kids of all ages can celebrate Christmas under the sea at the Newport Aquarium in Newport, Kentucky where the star attraction is Santa -- who arrives to scuba dive with shark rays. Holiday crowds are also treated to magic bubbles dancing to holiday music along with a visit with rare white alligators, Snowball and Snowflake, at the annual "Water Wonderland with Scuba Santa." • Only in Kentucky! Animated horses are depicted racing down the stretch, grazing on bluegrass, or clearing jumps thanks to tens of thousands of lights at the state's largest holiday lights show, Southern Lights Holiday Festival at the Kentucky Horse Park in Lexington. • In 1974, Kentucky Fried Chicken in Tokyo chain began promoting chicken as Christmas dinner for foreigners visiting Japan. The novel marketing campaign quickly caught on nationwide, and now every year Japanese families think it's completely normal to feast on a Japanese-style holiday bucket of KFC (that comes with cake and champagne) to celebrate the Western holiday. Christmas in Louisville - Check out the city's premier events with this year's complete schedule including the Winter Wonderland Parade, holiday tree exhibit, Santa's workshop and kid's activities. Christmas at the Louisville Zoo - Join Santa for a yummy meal, fun craft activities, and visits from zoo animals like Mistletoe the reindeer. Old Louisville Holiday Home Tour - Browse this year's schedule for the Conrad House holiday open house with online ticket ordering, info on more holiday happenings around town. Winter Wonderland of Lights Festival - Ashland's holiday extravaganza including a glittering show at Central Park, the annual Christmas parade, and holiday lights contest, with the complete schedule, map and directions, picture gallery. Christmas Tree Farms in Kentucky - Where to find them in Louisville, Lexington and throughout the state, with contact details and related links.